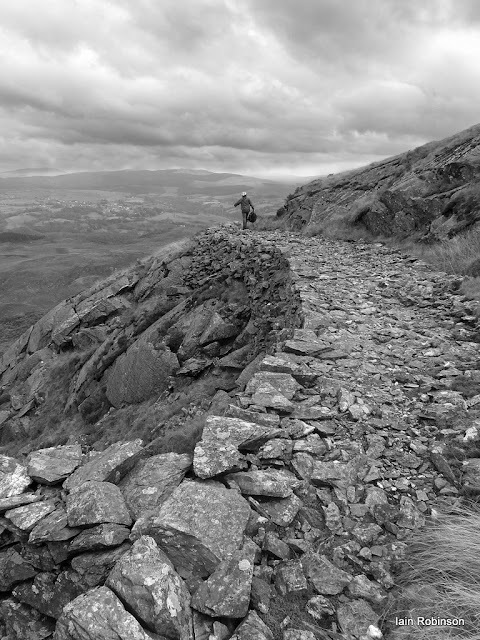 "Blanche" passes by on her way to Summit Cutting, with Moel Ystradau and the "Syenite Setts" quarry in the background. Often, in the search for ever more interesting places to explore, you can overlook something right under your nose. Early one dull morning, we'd had a stroll around Llyn Ystradau before getting on with work for the day. A train hooted and we both snapped off photos as it passed in the distance. I chimped* my shots, then looked over to Petra, who was gazing intently at the Moelwyn...she muttered: "Isn't that a mine?". 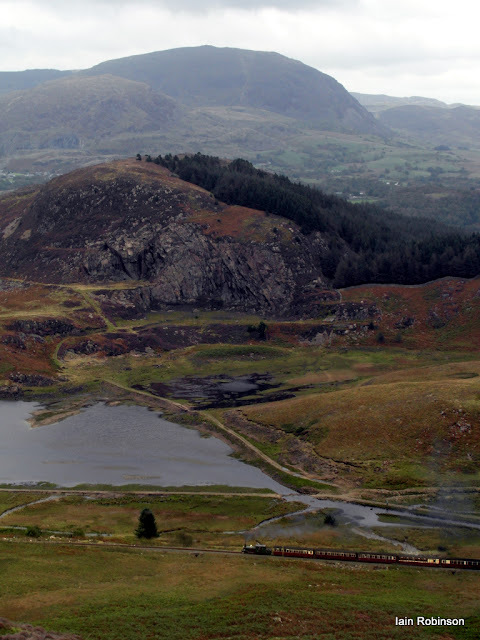 I thought at first that it might be the famous Moelwyn slate mine, whose inclines descend to the Ffestiniog railway in a series of majestic pitches. But this was lower, following a big quartz rib on the mountain. I didn't suppose it would be very interesting- the Moelwyn is so thoroughly tramped by ramblers, I reckoned that any adits would be gated up. 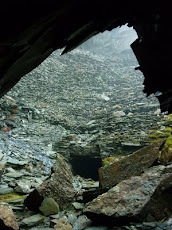 Very sadly, someone was killed in the seventies in one of the Moelwyn slate mine adits, falling down a shaft. Another lamentable result of this horrible tragedy was that all those lovely chambers were sealed off by grids. A root around on the internet and in my book collection unearthed some facts. 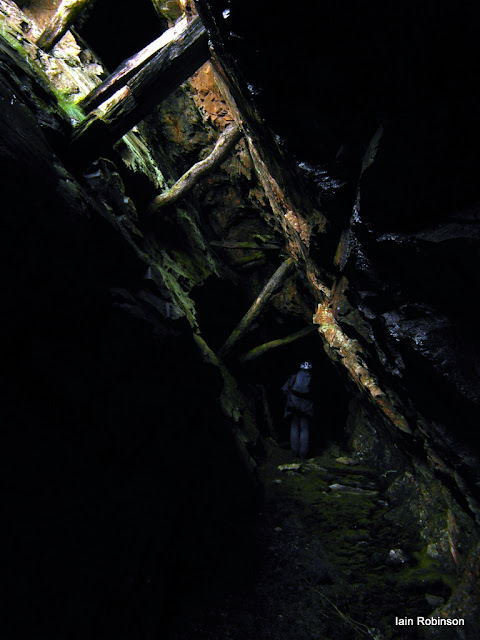 The mine was Moelwyn No2 , variously a manganese, lead and zinc mine. Also known as Gwaith Mango (great name!) and Gwaith Mein. 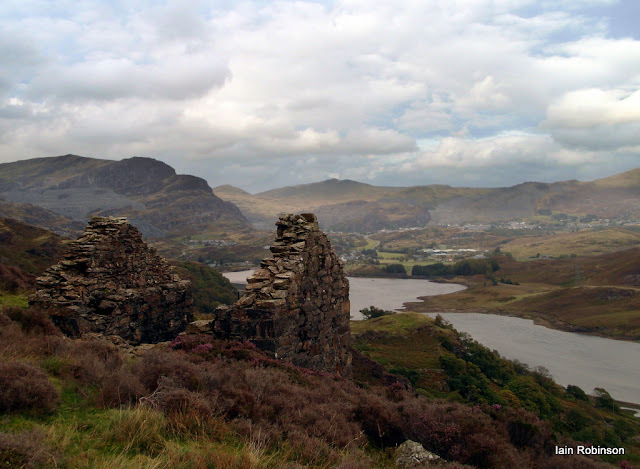 It had a siding to the Ffestiniog Railway and was opened around 1892 for manganese; later it was worked for zinc and closed just after the great war. The mine processing area is by the railway line at SH67633.43768, on a public footpath, which goes through what remains of the works. It's a tantalising place. The CEGB razed it when building the Stwlan Stored Hydro scheme, and dumped thousands of tons of rubble in front of the main adit. A pity, because judging from what I've gleaned, this was a corker, with a double track rail access.I guess it would just be too tempting for casual walkers to venture inside without equipment. A steep incline goes from the middle of the works up to a level above the oak trees, and we struggled up. Later we noticed the line of a tramway and then a miners's track which would have been a much better route, apart from the very deep bog near the FR stile which yours truly tried out by accident. 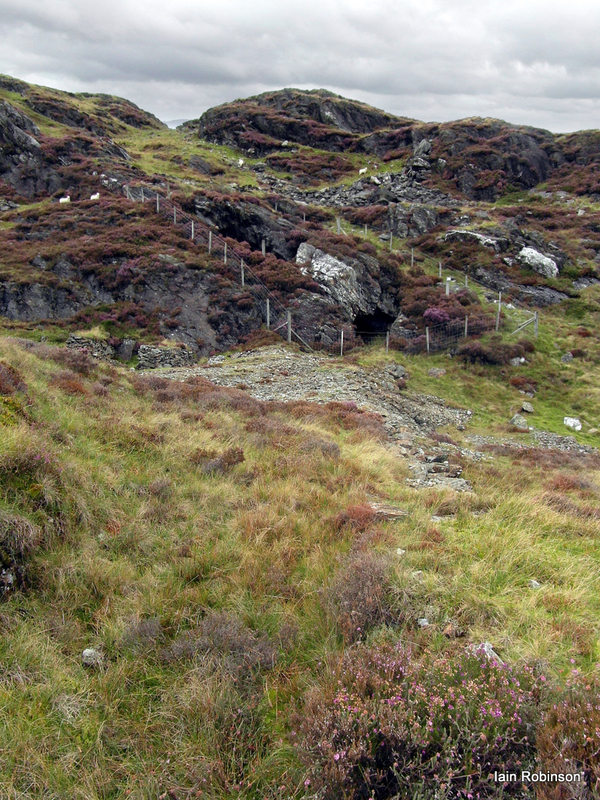 Up on the slopes of Moelwyn, the rib of quartz was very obvious, as were various tips and ruined buildings connected to the mine. We made our way to the first adit...the small tip suggested that it might have been a trial. 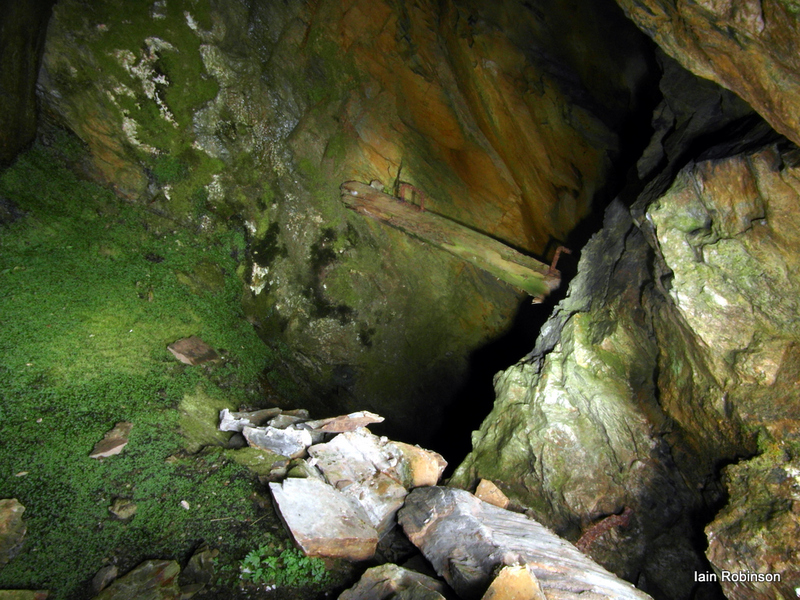 However, a short way inside the adit, a winze shot away, a huge baulk of timber wedged above the drop with metal hooks attached. 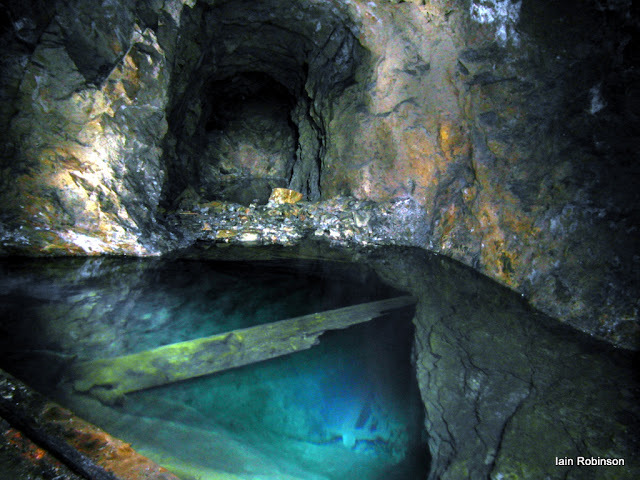 It went a long way down, possibly to the first level of the mine at the mill. The next adit, following the vein uphill, was ring-fenced. A form of protection which I heartily approve of. It keeps the sheep out, as they tend to be over-enthusiastic mine explorers. Plus, we have a handy bit of kit, made out of an old exercise mat, which enables us to circumnavigate this kind of fence. 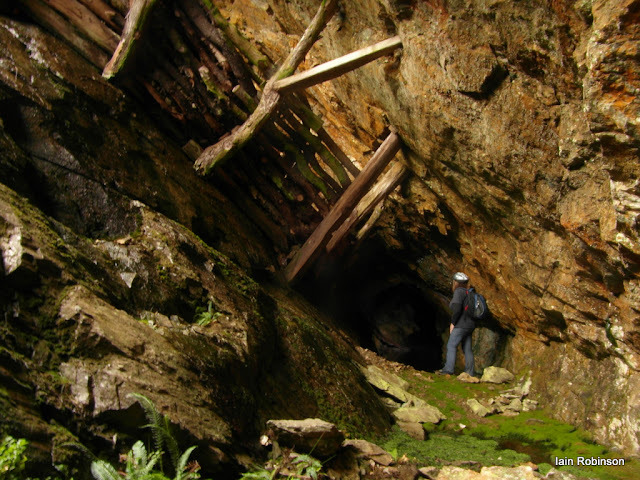 There were some impressive baulks of wood in the stope which were rigged to contain deads, although they didn't seem to have been used. 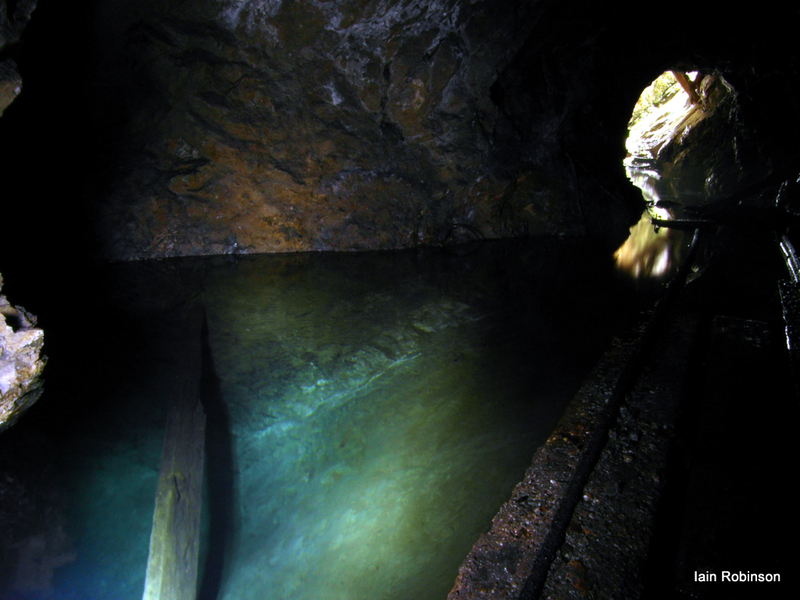 Inside, a bridge ran over a very deep, flooded stope.Very dangerous. Back outside, a superb revetted tramway ran along the contour line towards a further worked area. It was a little disappointing, although the stoping was quite spectacular. There was a great deal of an unusual moss inside which, try as she might, Petra couldn't manage to photograph. All the way up the hill, we'd been trying not to tread on small, furry caterpillars, hundeds of them, munching away at the heather. Fox moths, Petra tells me. I wondered how they would survive the coming winter. 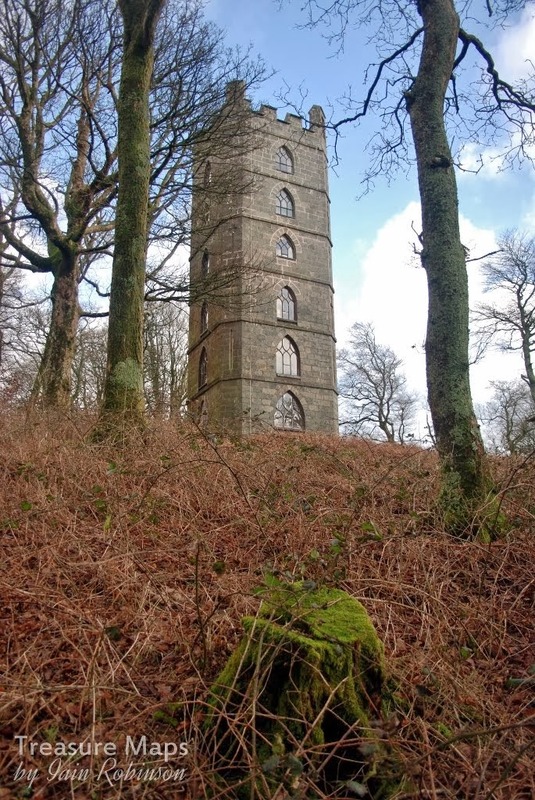 On our way down the hill, we could see a ruined drumhouse and more tips. 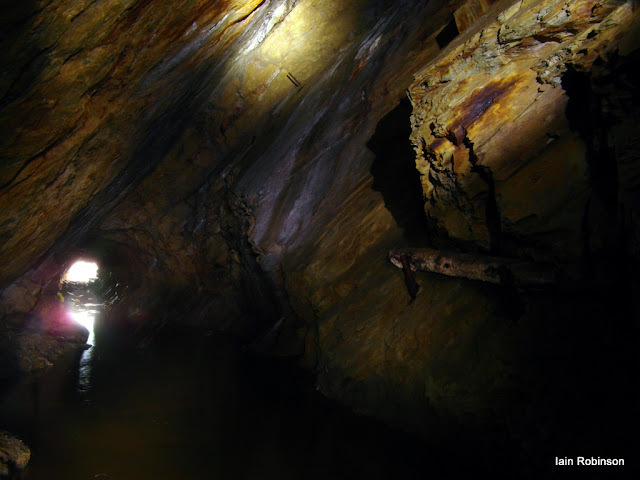 Above the drumhouse, a superb adit led through a stoped area to a collapse. There was a good deal of roofing upwards....above us, a small square of light hinted at a dangerous, open shaft somewhere above. To the right in the gloom, a winze dropped away at least a hundred feet below, as far as our lamps would shine. There was a ledge to walk on, past a small collapse. 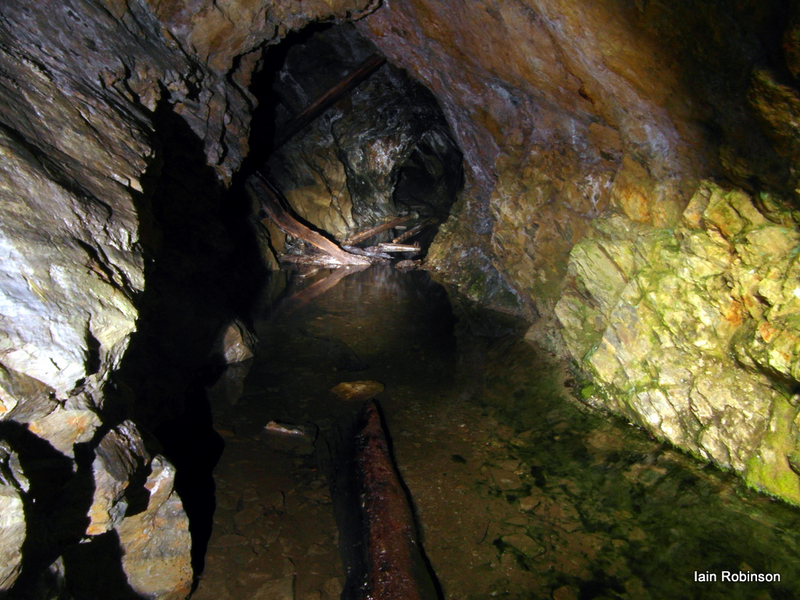 Here, the rock was fascinating, with the remains of the lode to be seen in the walls. It goes without saying, but it's not the sort of place to explore without very good lamps and some form of rope protection, as an investigation in the darkness here would end in tragedy. 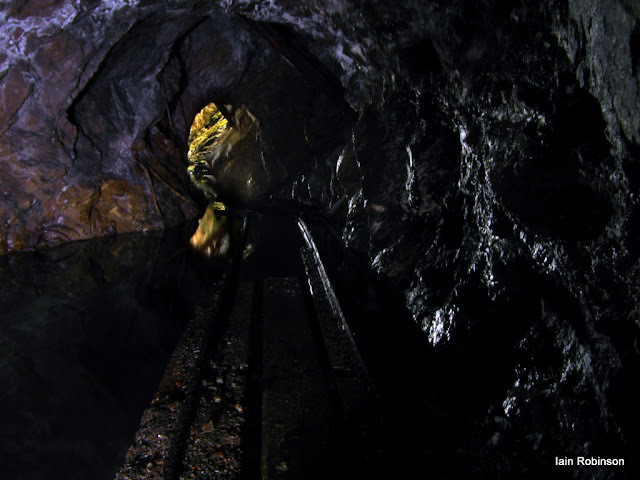 Further down again and an extensive work area and tips lay in front of a walled-up adit. No doubt this would have intersected the various stopes and would have been a perilous place to explore, but it is still frustrating to see it walled up. 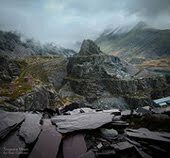 The drumhouse gave impressive, if gloomy views down to the Llyn and across to mighty Cwmorthin as the incline swooped below...but with darkness falling, we reluctantly headed for home. *chimping- a nerdy photo term for looking mindlessly through your photos on the camera. Link to Fox Moths on Petra's site "In the Green"
More fascinating detective work, Iain! The tiny train chugging across the landscape in your top image really gives a sense of the grand scale. A lovely set of photos altogether. Looks like there is some impressive timbering there, by the way. 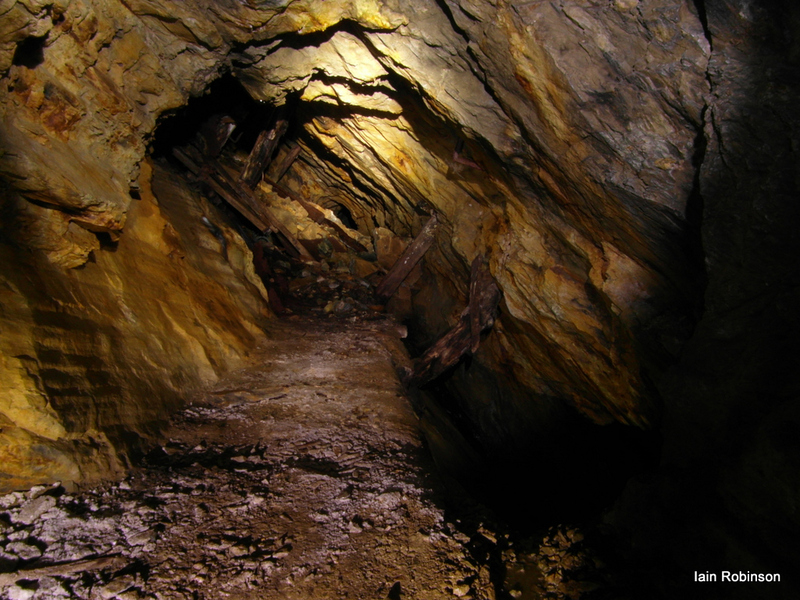 There was a joke some years ago that there were treacle mines in Sabden, Yorkshire. But I prefer your idea of fruit mines, altogether warmer and more cheerful! Glad you enjoyed the post. I love the quality of light in the last shot, and the atmosphere it creates. There is a real sense of the enormous quantities of rock being held apart by seemingly flimsy timbering.